The New Year’s Day Rose Parade in Pasadena, California, was interrupted by the arrest of 19 animal rights activists, including a 12-year-old girl who tried to stop a SeaWorld float depicting a family of orcas swimming free in the ocean. The arrests, which resulted in a significant delay of the event, occurred when the animal rights group, People for the Ethical Treatment of Animals (PETA), ran onto the float’s route, attempting to stop it. The demonstrators were immediately apprehended by the police and sheriff’s deputies without much of a struggle, and detained for violating the Pasadena municipal code that bars “interfering with a special event,” Pasadena police Lt. Terysa Rojas said. PETA called the event a “mockery of these highly intelligent animals’ lives” because at SeaWorld orcas are in captivity and apart from their families. Overall, around 100 PETA supporters took part in the demonstration. “Ironically, the faux orcas on SeaWorld’s float traveled farther on the Rose Parade route than the real orcas housed at SeaWorld did today,” PETA wrote on their website. A 12-year-old female animal rights protester, Rose McCoy, was among the 19 detained. She made headlines in November during the Thanksgiving Day Parade in New York by jumping over the barricades waving a sign, “Boycott SeaWorld.” McCoy flew all the way from the Big Apple to protect orcas in California. 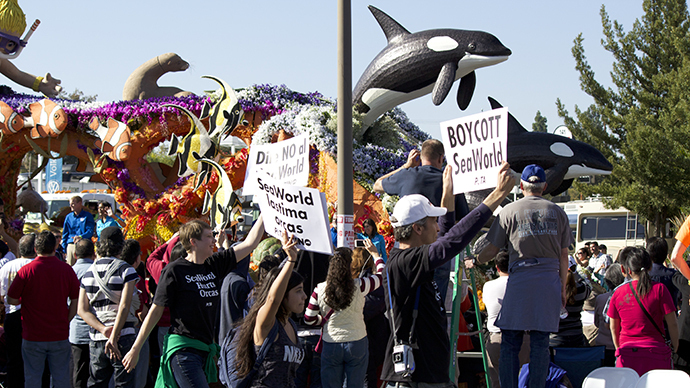 "We went in front of this SeaWorld float and we sat down," Rose McCoy told LAist. "Then a bunch of cops grabbed us and kind of threw us off to the side. It was slightly rough." Her mother was also arrested in the incident. Once taken to the police station, Rose McCoy was handcuffed and questioned separately from the adults. Calling her arrest “extremely boring,” she vowed to continue to battle for animal rights. "I'm going to fight SeaWorld as long as they keep orcas in what's equivalent to a prison," she said.